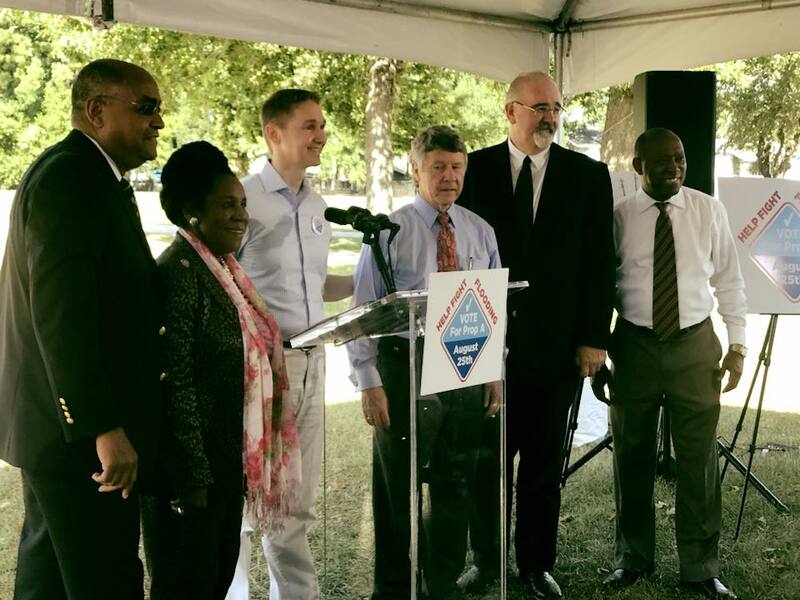 From left to right: Harris County Precinct One Commissioner Rodney Ellis; U.S. Representative Sheila Jackson Lee; Augustus ‘Auggie’ Campbell, President and CEO of the West Houston Association; Harris County Judge Ed Emmett; Harris County Precinct Four Commissioner Jack Cagle and Houston Mayor Sylvester Turner during the event held to support the approval of Harris County’s flood control bond. With early voting already underway, Harris County Judge Ed Emmett and Houston Mayor Sylvester Turner asked county residents Thursday to approve the bond to provide $2.5 billion for flood control projects. Emmett and Turner, as well as U.S. Representative Sheila Jackson Lee (D-Texas) and Harris County Precinct One Commissioner Rodney Ellis, Harris County Precinct Four Commissioner Jack Cagle, Augustus ‘Auggie’ Campbell, President and CEO of the West Houston Association, participated in an event held at the T. C. Jester Park to promote voting in favor of Proposition A. The election will be held on Saturday August 25.